Created tools and service for transitioning teens with chronic and complex conditions from their pediatric to their adult care provider. How can we make teens with complex conditions and their families feel empowered, in control, and ready to transition from pediatric to adult care? Six prototypes were experimented and gathered data. One prototype was very successful and utilized in a project around College students transitions. Presented recommendations of step, stretch, leap concepts to Children’s Center leadership for consideration of funding and implementation. There was no system for transitions. Pediatric care team members created excel files to keep track of patients who left their care because there was no hand-off or transition process. There was no confidence or trust that things were going smoothly with their adult counterparts. Systemic barriers made pediatric providers keep patients as adults. We heard stories about patients who were transferred to adult care, only to be sent back to pediatrics because there was limited access and the adult providers didn't have room to take the patients. Nurses are the glue that can bridge the two worlds. Nurses end up spending more time with the patients and families then most doctors. They play an important role in translating what the doctor ordered and making education relevant. When nurses were able to be a part of the transfer appointment, they were able to translate the new adult system and instill confidence that everything would be ok for the patient and parent. “My pediatric provider was like an uncle to me, and then he was just gone…” Patients and parents form deep relationships with their pediatric care team, leaving them is a big deal. We should not underestimate the relationship families have with a doctor who has cared for their child during their most difficult times and the impact it can have to be cut off from that supportive relationship. "I don't know how to let go" Parents take on the role of caretaker, knowledge holder and question master when their child is diagnosed with a serious condition. They want their child to just be a kid and not worry with medical responsibility. As a child gets older, it’s hard for a parent to let go and let their child take on the responsibility they need to be an independent adult. "I need to know what to do when we're not at the doctor's" Clinical visits happen at regular intervals, however, most major events in a patients’ life happen outside of those regular intervals. Parents and patients need to feel confident in handling life situations that may have a medical consequence. We created a transition journey with the phases Prepare, Plan and Transfer. Through collaborative workshops with various care team members we identified 18 various concepts to improve the transition process. Nine concepts were prototyped and tested. We discovered certain influence factors that can positively or negatively impact a transition. These factors are on a sliding scale for both a patient and their parent. We presented the team with a way to identify where a patient and parent are on these scales to tailor and improve their transition experience. Relationship with Care Team - The tighter the bond with the pediatric care team the harder it will be to transfer. If a high relationship, then more focus needs to be on building the relationship with the adult provider and not cutting ties with pediatric team. Engagement - This is the individual's degree of involvement in the process, seeking out information, finding role models and being proactive. The more engaged a patient is the more positive the transition to adult care will be. Several tools that were tested helped assess and increase a patient’s engagement. Compliance - This relates to a medical goal a provider sets for a patient, usually a number from a test or usage of medication. The more compliant a pediatric patient is with their doctors’ orders the more positive their relationship starts with their adult provider. 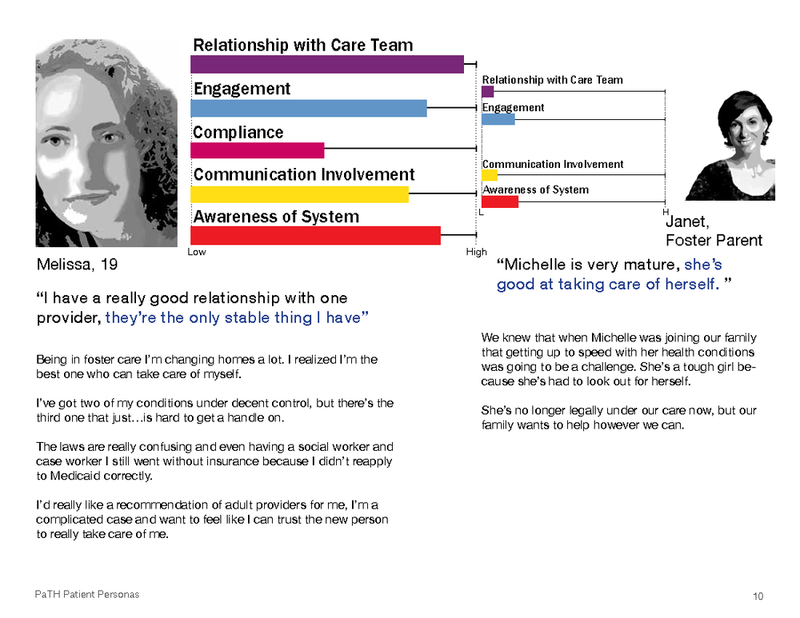 Communication Involvement - This indicates who is communicating with the care team in appointments, on the phone and online. This is something to be aware of because in adult appointments the parents are no longer invited into the room. Communication involvement should be assessed before transitioning and balance out the patient and parent early in the transition process. Awareness of System - This refers to a patient’s or parent’s ability to navigate insurance, bills, community resources and legal documents. The more savvy a patient is at understanding and navigating the entire healthcare system the more successful they will be in adult care. 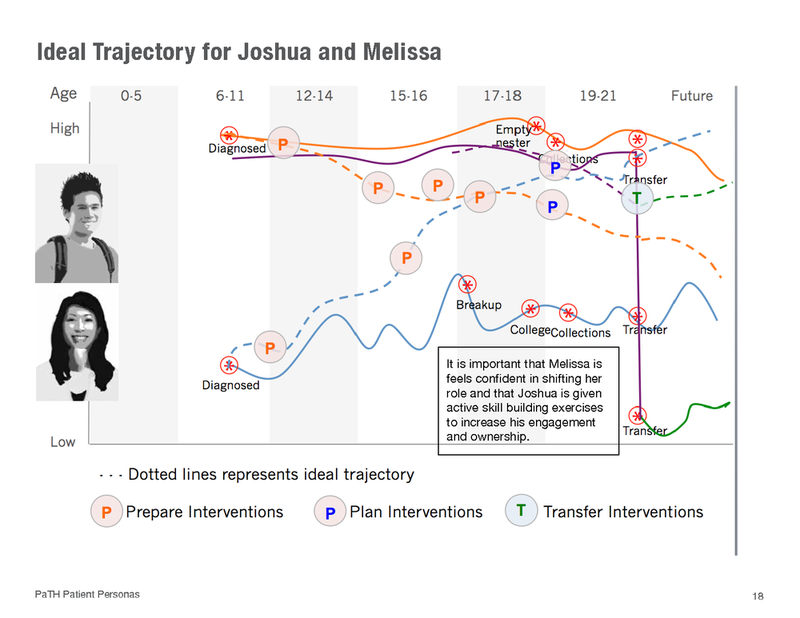 I worked with one other service designer and partnered with the Children’s Center across multiple departments to identify and prototype ways to improve the transition of young adults from their pediatric care team to a new adult care team. We researched the transition experience at Mayo Clinic and at institutions across the world. We conducted surveys, interviews and observations across 11 pediatric departments. We mapped out all possible experiments and narrowed down to the top nine to prototype. What: Three different conversation tools used with seven patients. Why: Care Teams struggle to get teenagers to open up and talk using traditional interviewing techniques. After observing appointments, we created three different tools for the social worker to try out. Outcome: The tools were productive in sparking conversation among all the patients addressing topics such as dorm room needs, safety in college, mental health concerns and condition questions that had not been discussed in previous appointments. "It helped us be intentional in how we enhance our appointments. It let us pause and be mindful of how we're addressing and understanding our patients' needs." What: Digital and paper-based assessment cards. A patient starts on Level 1 and works their way through Level 4 with an optional Level 5. Nurses introduce the cards and ask the questions in the appointments. The cards are then able to go home with the patient for the parent to use outside of appointments. Why: We created these cards based on the realization that all current patient assessment tools were written for the providers, not for the patient or parent. Our hypothesis was that these cards would more truly allow the care team to see what a patient knew and allow for the parents to know what types of conversations to have and reinforce at home. Outcome: Valuable patient information was identified through the use of the cards such as a patient not sleeping, feelings of depression and lack of knowledge around the importance of having an EpiPen for a severe allergy. These cards went home with parents and teens and allowed for the conversation and correct re-enforcement of information to happen outside of the clinic. Used with 14 patients ages 9-23, only three patients progressed to level 5 in one appointment. These cards were also adapted for another project focused on high school seniors transitioning to college at Arizona State University. "Did you see this mom, I'm supposed to do more of the talking, not you"